Researchers at the University of Michigan in Ann Arbor have created organic solar cells that can achieve 15 percent efficiency, which is in the range of many conventional solar panels on the market. 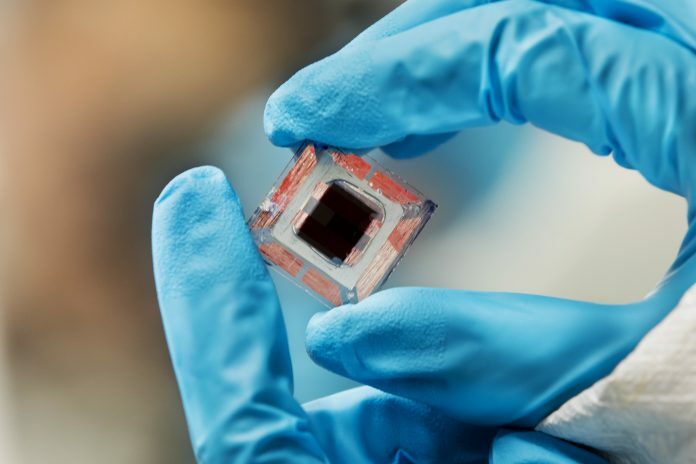 The advancement could make more flexible, inexpensive solar cells commercially viable. Unlike conventional cells, which are silicon-based, costly to make, and made of thick, rigid sheets that require fixed installation points, organic solar cells incorporate carbon into their construction. Carbon-based cells can be inexpensively manufactured into rolls, and can bend around structures or within clothing. They can also be made in multiple colors, including transparent. However, they have lacked the efficiency of other cells, until now. “Organic photovoltaics can potentially cut way down on the total solar energy system cost, making solar a truly ubiquitous clean energy source,” says Stephen Forrest, an engineering professor who led the work. At 15 percent efficiency and given a 20-year lifespan, the researchers estimate organic solar cells could produce electricity at a cost of less than 7 cents per kilowatt-hour. The average cost of electricity in the United States was 10.5 cents per kilowatt-hour in 2017, according to the U.S. Energy Information Administration. “For the last couple of years, efficiency for organic photovoltaics was stuck around 11 to 12 percent,” says Xiaozhou Che, a doctoral candidate in the applied physics program. To improve efficiency, researchers designed a system that combines specialized layers of two types of organic cells to absorb both visible and infrared light. The team developed interconnecting layers that prevent damage to the first cell while still allowing light and electrical charges to pass through. “That’s considered a difficult process because there’s a chance the liquid used in processing the top cell will dissolve the layers already deposited underneath,” says Che. The team’s process, design, and materials demonstrated a fabrication yield of more than 95 percent. The researchers want to push their efficiency further. The study was published in Nature Energy on April 23.